In the next episodes of 'General Hospital' Shiloh unmasks Brad and puts pressure on Sam. 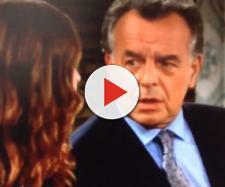 "General Hospital" spoilers indicate that Shiloh will discover that Sam has the DoD cup. In this way, he will prevent the testing laboratory from performing the toxicological test. Shiloh will understand that it was Jason who kidnapped Kristina and will plot a terrible plan for revenge. GH spoilers also reveal that Jason will be arrested, most likely because of Shiloh. Sam must do everything possible to protect Kristina and not let Archer discover the secret place where he is. The tension is very high and we can't rule out that, for someone things, end very badly. What will happen? Another storyline that deserves attention is that of Oscar being close to death. The boy, surrounded by his family's love, is ready for palliative care. At least for the moment, there is no news that gives hope for a happy ending. Fans don't want Oscar to die, but for this to happen the only possible hypothesis is that of a miracle or an experimental therapy. "General Hospital" spoilers reveal that Shiloh will realize he's been betrayed by Brad. He has taken the cup of the sect into which Kristina's drinkable drug has been poured. As faithful fans should already know, after drinking the concoction, the young girl lost control and let herself be manipulated by Shiloh and the members of the sect. Luckily, before the initiation ceremony, Jason managed to kidnap her and take her to safety, away from the attic of the DoD. Subsequently, the cup was taken to GH, for laboratory testing to detect the presence of drugs or narcotics. The spoilers tell us that the tests will never be carried out. Shiloh will, in fact, arrive just in time to intercept Brad and the cup, preventing doctors from performing the test. At the same time, Shiloh hopes to also intercept Kristina to bring her back to the community house. Other "General Hospital" spoilers say that Jason is going to make a shocking discovery. He will understand that Brad is a member of the DoD and will be shocked. Fans of the ABC soap opera will see Kristina's situation plummet. On the one hand, the girl needs the protection of the sect, while on the other Jason will do everything to make her understand that the DoD is only a danger. At the same time, Shiloh will understand that it was Jason who kidnapped Kristina. His priority now is to put pressure on Sam to find out where the girl is hidden. "General Hospital" (GH) spoilers finally reveal that there will be an unexpected twist, namely Jason's arrest. Is Shiloh responsible for this? Meanwhile, Oscar's state of health will deteriorate further.